The simplicity and intuitive design of Apple products makes them a popular for inclusion in K-12 settings. From iPods to iPads to Macbooks, these powerful media consumption and creation tools can be used to open up learning opportunities for students. John Sowash (fearless leader of Sowash Ventures) help launch one of the nations very first 1:1 iPad programs at Southfield Christian School outside of Detroit, Michigan. John was involved from the beginning, helping select appropriate apps for students, developing training for faculty and students, and supporting the launch of the program early in the school year. 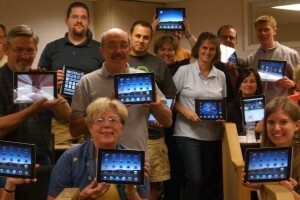 Based on experience gained from the launch of the 1:1 program, John went on to help organize the iPads in the Classroom conference sponsored by the Michigan Association of Computer Users in Learning (MACUL). During this workshop John was able to share best practices with educators from around the state regarding using iOS devices in a classroom setting. John continues to support educators as they integrate Apple technology into their classrooms. Contact us to inquire about John’s availability to assist with faculty training or the planning of your 1:1 initiative. John has made his iPad in the classroom resources freely available on the web.